Black Widow Spider – By Juliea Huffaker. We found this girl under a BBQ by the propane tank with several egg sacks. Black Widows are a common pest for residents of the greater Phoenix Arizona Valley. 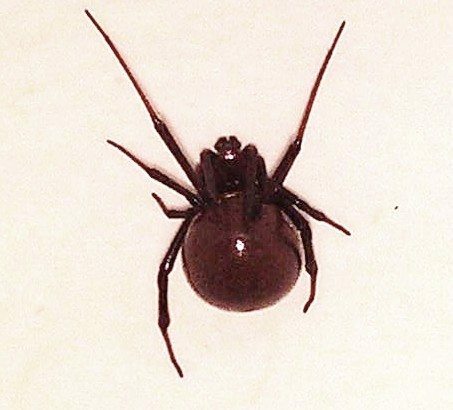 If you’ve been bitten by a Black Widow Spider, call your Doctor, or go to an Emergency room. All Responsible Pest Control services are totally GUARANTEED! Providing superior Pest Control Service by: applying only Premium Products, using Responsible Application Methods for the SAFETY of your family and pets, utilizing our 22+ years of experience, continuing education & training, and giving attention to details. For all customers on regular pest control programs, free retreats are provided between services if ever needed. Initial service is a ”Clean Out” to exterminate pests already inside your home & yard. After a Clean Out, we’ll schedule you on your regular pest control program. Our GUARANTEED services focus on eliminating Pest problems from the outside, Eliminating Pest problems BEFORE they get inside! (Interior treatments are free upon request.) Scorpions, Spiders, Roaches, Termites, Bed Bugs, and other pests live ALL year long in our Arizona Desert! Regular pest control services MAINTAIN a protective barrier around your home & yard all YEAR ROUND. GUARANTEED Termite & Pest Control in Mesa, Phoenix, Glendale, Chandler, Gilbert, Scottsdale, Peoria, Queen Creek, Maricopa, & surrounding areas.